When I was about to turn 16 years old, my parents bought me my first luxury purse, which was a classic Louis Vuitton Neverfull MM. Flash forward 7 years, and I still regard it as one of the most sentimental things that I own, since it brings back so many memories of my prime teenage years. It was definitely the sweetest of Sweet 16s, and the bag still sits proudly back at home many years later. Granted, the Neverfull was a gift, and it would take a couple more years (7, to be exact, to the date) for me to purchase my own luxury handbag with my own money. Buying the bag in Europe would be cheaper since many luxury goods are priced lower in European countries, AND I would get a VAT (tax) refund when I flew home (more details on this later). I had been saving up for months and finally had some disposable income to splurge a bit. I contemplated purchasing a bag before on previous trips to Milan and Paris, but it never made sense for me to pull the trigger without the proper finances worked out to back up the purchases. I wanted to write about the experience of buying my first luxury piece because I found it incredibly helpful to read about others’ personal stories. For those of you who are looking to splurge or make a large purchase like I did, I know how exciting it is to go through the process of finding something you love, saving up to buy it, getting it in your hands, and then falling in love with it more and more everyday (sounds like a prince-charming love story, doesn’t it? Minus the purchasing part lol). Here are my top tips, tricks and fyi’s for making your first (or second, third, etc.) luxury handbag purchase! From totes to backpacks to crossbodys and clutches, the options out there are endless and exciting. I really took the time to think about what kind of use I would get out of my bag, and whether or not I wanted it to be used on a daily basis, like I would use a work/laptop bag, for more casual outings out with friends, or for an night out in the city. Everyone has personal preferences and tastes, so the choice of what style to choose really comes down to what you value and prioritize when it comes to choosing a style of bag (especially your first designer piece). I went with a top handle, since I ultimately wanted something that would be worn more occasionally than frequently, and would be be subject to daily wear and tear. 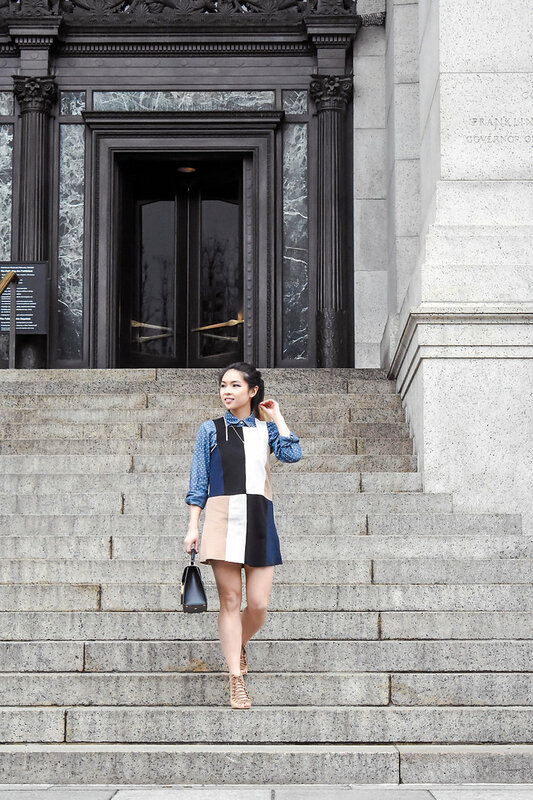 Although I would use a work bag more frequently, I preferred the bag I bought this time around to be saved for the special days out to brunch with the girls or to dress up an outfit for an evening date. I also loved that the top handle came with a detachable black strap that instantly adds some practicality. I never really considered the retail value of a bag until I started doing more research about the benefits of choosing to buy from a brand that holds its resell value higher than others over time. Take Hermes, Chanel, and Louis Vuitton, for example, which are just a handful of brands that collectors say are worth investing in for a sweet return in the years to come. My LV Neverfull cost about $600 (before tax) back in 2009, and is now being sold for over $1200 at retail! Though I have no intention of selling it anytime since its personal value is priceless, it is a satisfying feeling knowing that the investment is worth it. Granted, keeping this high value is a result of taking good care of your bag over time, and to be careful of wear and tear when you do use it. Some people like to invest in stocks and real estate, and other enjoy spending that same cash on bags that could turn a profit in the future. The resale market of luxury goods and handbags is not to be overlooked, as the industry is valued at $16 – $25 Billion. There is a lot to be said when it comes to counterfeit handbags, and it’s mind-numbing to believe that it is a billion dollar industry. If you are purchasing from a 3rd party like Ebay, or on reselling websites, be sure to do your research to make sure you are getting an authentic piece. There’s nothing more disappointing then realizing you paid an arm and a leg for a counterfeit item that was not created with the brand’s integrity. Read more about trending articles within the counterfeit industry from the Huntington Post! Shopping online is one of our greatest luxuries these days, and comparing different bags on the internet side-by-side is extremely helpful and can help you with make the ultimate decision. 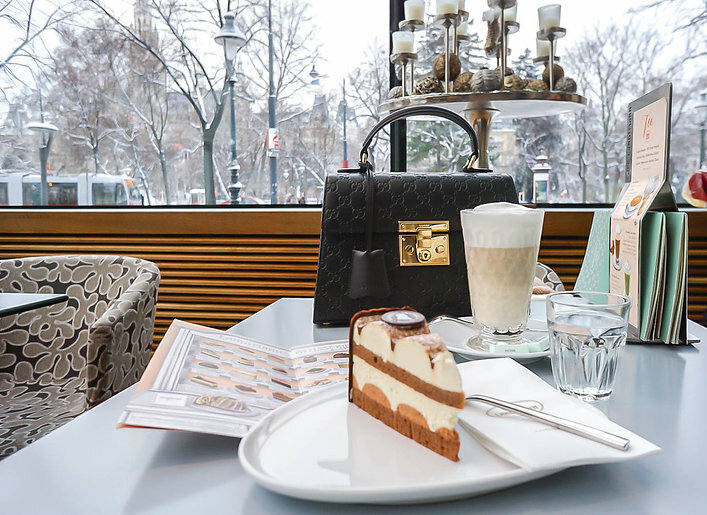 When I went to Vienna, I actually visited a few different stores within the same afternoon, including Louis Vuitton, Gucci, Yves Saint Laurent, and Prada, in order to compare everything that I had seen online. I found it even more helpful to see and feel the bags in person, since trying them on and comparing the sizes and colors in real life is often different than just looking at a photo online. Granted, you can always decide to order it off the net once you leave the store, but an in-person visit may help you make an easier decision on what to rule out if you are deciding between a couple of choices. My final two picks were between the classic Alma PM from Louis Vuitton (in the color, Dune), and the new Gucci Sylvie Crossbody. I ultimately ended up back at the Gucci store, and was about to pick up the Sylvie, before the Gucci Padlock bag caught my attention. I had seen it online a couple of times and ruled it out because I wasn’t in love with it from photos, but seeing it in person made me quickly change my mind. I absolutely love this bag, and am extremely happy about my final decision, since it is both functional in size and color, and I think very fitting of my personality. Window shopping is always a lot of fun and I encourage going out to the boutiques and retail shops in addition to online browsing! If I had an unlimited amount of disposable income, my closet would be lined wall to wall with jackets and coats, and I would forever live in luxury handbag heaven. Unfortunately, that is still only a dream for now, and coming back to reality means fully understanding my financial capability to purchase a designer bag for myself. Since I lived rent-free for a couple of months after I started working, I was able to max out my savings in multiple retirement accounts AND have enough leftover to take a trip to Europe and purchase a gift for myself. There is no reason to go into debt in order to have some shiny, new arm candy, so never make impulsive large purchases without consulting your budget! One of the biggest reasons why I purchased my bag in Europe was because I knew it would be cheaper given that the bags are usually priced at retail for less than in the United States even after the currency conversions. This makes a lot of sense given that many designer handbag brands produce merchandise in European countries. When you visit the European Union as a non-EU citizen, you may be entitled to get some money back from your shopping purchases if you meet the eligibility by spending a certain amount on goods. Items are usually priced with a Value Added Tax (VAT) already included, so when you leave the EU, you can get a certain percentage of money back at the airport or at VAT refund places in Europe. Each country has a slightly different percentage, so if you are doing a Euro tour, I would consider looking at different rates for the best possible deal. I made sure to bring my passport with me when I went shopping, asked to get documentation for the VAT return (or they will usually ask you if you want it), and then brought my completed forms with me to the airport. In the last EU country you visit (either direct or with a layover), you will show your purchased items at a Tax refund booth, and will get the option of getting the money back either in cash or via credit card. The amount you get in cash is usually less since it is subject to more fees, but I decided to not gamble with high frustration later in case the refund did not go back on my credit card. This option usually is not an issue, but I sometimes enjoy instant gratification, and didn’t mind the small loss to get my money back immediately! Always take advantage of the VAT refund if you make larger purchases in the EU. It is basically free money, and a great way to save a few extra bucks on a luxury item.